In my first book ‘The Genesis of Freemasonry’ I discussed the importance of the Watkin Williams Wynn family to Freemasonry, a number of prominent members serving as Provincial Grand Masters in Wales during the nineteenth and twentieth century. Sir Watkin Williams Wynn, 3rd Baronet was a Jacobite and resided at his estate at Wynnstay in Denbighshire in North Wales. His son, the 4th Baronet became a Freemason, founding his own lodge which met on the estate in the latter part of the eighteenth century. The main house is now demolished and the remaining buildings are now apartments, though the chapel still exists and reveals evidence of Masonic influences. A branch of the same family – the Williams family – resided at Bodelwyddan Castle, which is situated near St. Asaph. This branch of the family also built the nearby ‘Marble Church’, and both the castle and the church are a celebration of Victorian Gothic architecture. 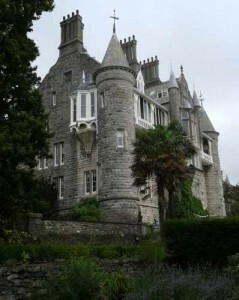 The same branch of the family also constructed a magnificent Gothic Chateau overlooking the Menai Straits on Anglesey, a Chateau that I stumbled upon during a recent visit to the island. The Williams’ drew on the Chateau Chamord in the Loire region of France for its inspiration, the family having travelled there. Though this branch of the family have no apparent links to Masonry, the architectural splendour of the Chateau conveys a celebration of architecture and a rich heritage of building design in Wales, and of course, the importance of their extended family within Freemasonry in Wales is also important.